This is the pie-fert recipe. 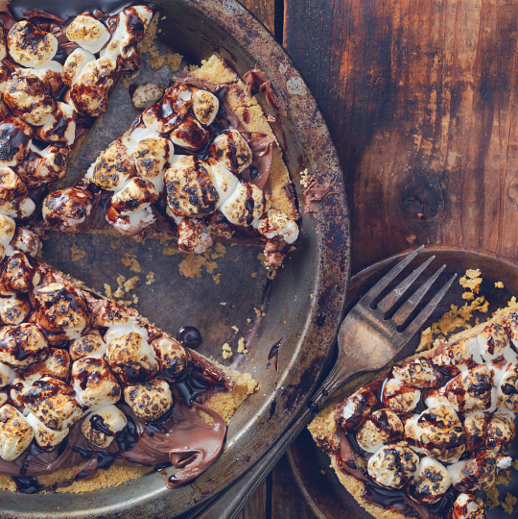 Delicious chocolate and smores pie. Preheat oven to 350°F. Make crust: Combine crumbs, butter and sugar in a bowl. Mix well and transfer to a 9-inch pie plate. Press evenly over bottom and sides. Bake until firm, about 10 minutes. Cool completely on a wire rack. Make filling: Bring cream to a boil in a small pan over medium-high heat. Place chocolate in a bowl; pour cream on top. Let sit for 5 minutes, then stir until smooth. Whisk in eggs and vanilla. Pour into crust; bake until set, about 25 minutes. Cool on a rack. Just before serving, preheat broiler to high. Set an oven rack 5 inches from heat source. Spread marshmallows over top of pie. Broil until toasted, watching carefully to prevent scorching, 20 to 30 seconds.